Once upon a time I considered swapping my nice current iPhone 5 for the new and seemingly slightly better iPhone 6. Nothing crazy yet. Since not being in a hurry, the pre-orders frenzy and all the crazy queuing were not on my list and I finally happened to put my hands on a phone yesterday, in a (non-Apple … I know, still beating myself about it) store. And welcome to Australia by the way. Since Telstra is major here, not having the iPhone in store would definitely not make sense. Not only for the sake of being able to offer the main products on the market but also to draw advantage of the marketing impact of the device itself (or devices indeed). Oh joy, since a few weeks after the launch, The smartphone was there on display for every commoner to approach – and even test – it. Before moving to hands on matters, I would begin with a slightly more business-oriented observation : the absence of a crowd. First, not a single body to be seen around the iPhone 6. And nobody apparently willing to show even just a sign of interest for the device. Ok, I may have come to be more geeky than I thought and all the buzzing around this phone may not mean people should show interest. Still … . Then, in a shop where a couple of dozens of customers could fit, only one person was to be seen, nonchalantly browsing the various phones on display. While a bunch of sales people were apparently busy having a chat between themselves. Why should I care ? Well, for once, no one came to me wondering if I may need help with a purchase or just even information. As a customer, I do not necessarily like to be disturbed while quietly browsing stuff I will certainly not buy. And as logic wants it, I would definitely ask, would I need further details. So, there I was, happy bunny, testing this new iPhone which, by the way, is already too big in its small version and could have kept on offering black as a color. That is until I set on looking at the touch ID. The oh-so-new feature for me, poor user of a 5 with no such (fun ?) technology. And so much for conspiracy theorists (yes, the NSA collects your prints from your iPhone) that did actually trigger the most amazing response from the bunch of sales people with one lady rushing to ask me to stop. Because … I would “lock the phone”. – But “this is a demo, Mam’”. – “Please stop or the phone will get locked”. – “Erh … demo ?”. But facing a crazy look and a person who, visibly, does have no interest in a (minimum) 800 Australia Dollars sale, that was me on my way. This is a more serious take regarding this slightly funny story. The iPhone, in Telstra’s case, is basically not only an added offering to the range and the ability to offer the full portfolio of devices, it is also a necessary one for a telephony leader. They basically have to have the iPhone on offer. But, also, the phone serves as free marketing and lead generation. I am the example of it as I only stopped at this shop when seeing the phone on display. And that is the perfect bait – when customer-hunting – as it would draw a population of potential buyers with the ability to foot the bill for a high-end device. Yet, the bait is not enough. Especially if next to the bait, you put a scarecrow. In the form, here, of a lazy sales team and a – seemingly – crazy sales person. Not letting a potential customer test a product is already bad enough but done in a questionable way it then raises further questions, not only on the people but the brand too. Here, that is a lead lost, a very bad image for Telstra and, well, a post about it which will be read by the hundred of thousands of you (I wish …). Generating leads is not easy. When you have a bait like the iPhone to generate easy leads make sure to have the right structure in place to handle the second part : closing the deal. 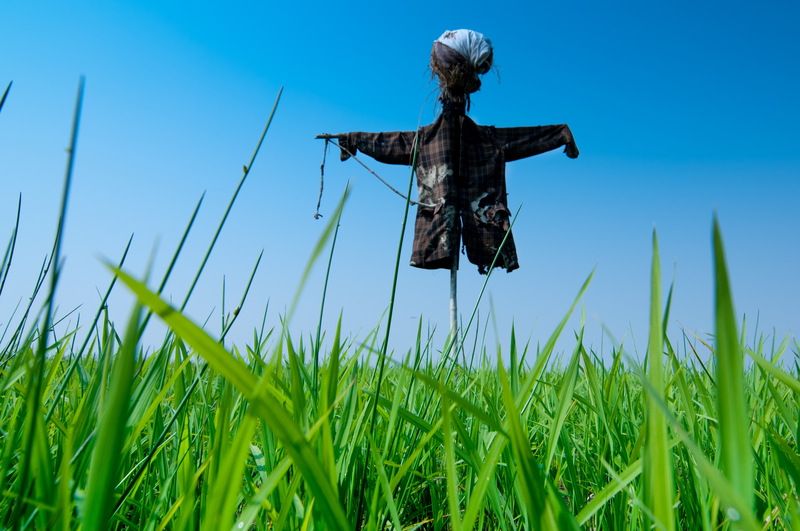 And not just a bunch of scarecrows.